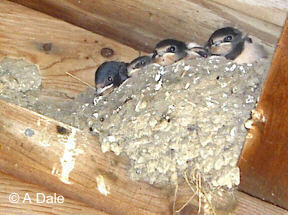 Swallows are regular nesting visitors in the outbuildings. The four youngsters pictured top right on 08.08.2003 were the second brood of the year. They had all made their maiden flights and were gone by the end of the month. An interesting feature of that 2003 nest was that as the four youngsters outgrew the original platform, the parents added an extension to the left. In 2004 the nest (lower right) was extended from the start and housed broods of five comfortably. After renovating the same nest in 2005, one pair were found dead on the ground underneath it and the nest remained unused. A mere 50cm away a second pair constructed a new nest from scratch and used it to raise two broods in 2005. It is possible to argue that the deaths may have been due to a demarcation dispute. Year 2002 Three pairs raised 8 broods of four. All 38 departed early September. Year 2003 Two pairs nested and each pair raised two broods of four. Twenty departed at the end of August (rather earlier than usual). 02.06.2004 Half of an egg shell found close to the nest. And much more frequent flying visits by the parents to the nest suggests we have a brood. A second pair are nesting in a nearby shed. 10.06.2004 Five open mouths seen at nest edge. 25.06.2004 Five youngsters on the wing. 11.07.2004 Five more eggs in the nest. 06.08.2004 Five gaping mouths at nest edge. 13.08.2004 Second brood of five on the wing. 05.09.2004 A big gathering of about 80 - and then they were gone. 09.09.2004 One late family still around the sheds. 16.04.2005 First solitary arrival seen. Inspected last years nest site. 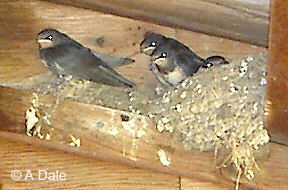 02.05.2005 We now have three pairs prospecting for nest sites. 10.06.2005 Two birds found dead on the ground underneath last years nest. This nest was not re-used. 08.07.2005 New nest only 50cm from the vacated one with five young clamouring for food. 17.07.2005 18 birds, adults and young on the telephone wires trying to encourage the brood of five to leave their nest. 10.09.2005 The second brood of four successfully took to the air. 18.09.2005 ..... and then they had gone. 12.04.2006 The first 2006 arrival wheeling over the meadow. 17.06.2006 The first brood of five fledged and on the wing. July 2006 A second clutch of eggs did not survive the heat under the eaves. 31.08.2006 But the third clutch survived and four fledglings are on the wing. 14.04.2007 First arrivals on the telephone wires. 22.04.2008 First arrivals on the telephone wires looking pretty jet lagged and spending a lot of time preening. 14.04.2009 First pair to arrive already sprucing up last year's nest. The question is often asked, "What is the difference between a Tree Sparrow and a House Sparrow?" - and here in one lucky photograph is the answer. 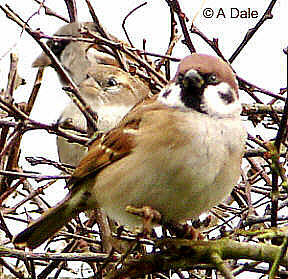 The Tree Sparrow, in the foreground, has a brown head and black cheek patches (both sexes are quite similar). 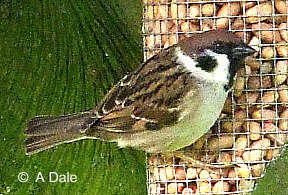 The male House Sparrow at the back has a grey head and no cheek patches. And the female House Sparrow in the middle is rather plainer with a light flash above the eye. In the mid 1990's, in this rural location, Tree Sparrows out numbered House Sparrows 2 : 1. But, as in most of the UK, House Sparrow numbers were seen to fall and by autumn 2006 we had a resident flock of 40 Tree Sparrows and only 4 House Sparrows. So to accidentally get two of the latter in the same picture was somewhat fortunate. As far as I have observed, the Tree Sparrow shows no preference for trees at all. They seem to favour dense hedges for shelter from predators (Sparrow Hawks, etc.) and quite happily nest in old buildings, open sheds and - hedges. When nesting in buildings they will settle for more open nesting sites than the House Sparrows which tend to choose enclosed nooks and crannies, under eaves, etc. The thick chunky beak indicates that they are mainly seed eaters but they do feed their young on insects and caterpillars. They raise two or three broods of 4 - 6 young each year. August 2006 Busy, noisy flock of 40 in adjacent paddock. 05.12.2006 Having dispersed in the Autumn, 24 are now back to the seed feeders. ..... 2012 Flock of around 30 Tree Sparrows in permanent year round residence with one or two pairs of House Sparrows as casual visitors. 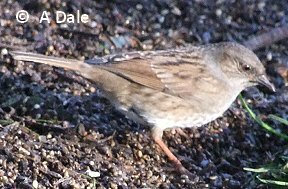 In my youth I knew this bird to be a Hedge Sparrow but, over the years, the generally accepted common name became the Dunnock and the more astute knew it as the Hedge Accentor which has two very similar relatives, one found in NW Scotland and the other on mainland Europe. It is a shy inconspicuous little bird, about the same size as a sparrow and is usually seen in and around hedges as a solitary ground feeder on the fringe of any communal feeding activity of other species. Unlike the sparrows and finches it has a thin beak which favours an insect diet but it will take small seed like millet. Breeding begins in April and three broods can be raised in a year. Annually but - never seen in any great numbers. 01.02.2015 Two seen on the ground under the seed feeder. The Greenfinch used to be a common garden and farmland bird but the UK population saw a significant decline in 2006 due to the 'Sindbis' bird virus. The virus had previously spread through Europe and Scandinavia so its arrival in the UK was probably inevitable. Fortunately, a sufficient number of birds had a resistance to the virus and in 2009 the population appears to be recovering. Like all finches it is a seed feeder, characterised by its sturdy, squat beak and, true to its name, it is green. In the breeding season, the males are a rich olive green with bold flashes of yellow on the wings. The females are duller and less striking but still undeniably green. Nesting usually begins in early May with 4 to 6 eggs being laid in a moss and grass lined nest in dense bushes and evergreens. At least two broods per year are expected. The young are fed on insects and larvae before being introduced to regurgitated chopped up seed. 2009 8 daily visitors to the seed feeder. 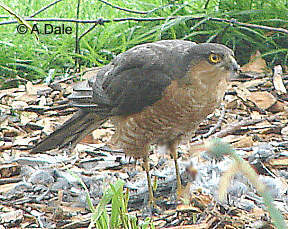 This was a first time visitor to the garden in April 2008. Whether it was an immigrant from Europe just passing through or, a neighbourly visit from a nearby pond that is maturing nicely, only time will tell. 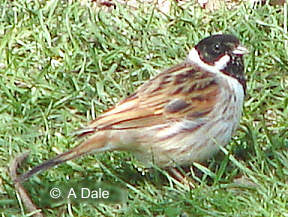 Reed Buntings were originally named after their preferred habitats of wetland and marshy areas throughout all of western Europe, wherever reed beds were to be found. More recently they appear to be adapting to a drier farmland hedgerow environment. They feed on seeds and insects so, they can afford to be opportunistic about where they settle. The male in the image is well marked and easily recogisable with his black head and breast and distinct white moustache. The female has much more subdued plumage and could be confused with several other species. She lacks the black head and bib and white moustache but sports pale eyebrow flashes. They nest low down in reeds and hedges in a nest of grass and moss and can raise two or three broods of four or five chicks a year. 06.04.2008 First time visitor to the garden, under the seed feeder. 19.03.2009 A return visitor to the seed feeder. 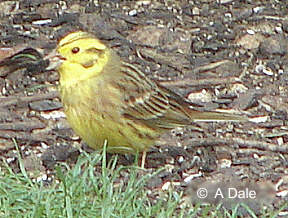 The Yellowhammer is reckoned to be common in rural areas but, until 2008, had been scarce in my locality. In the past we have only had the odd winter bird under our bird feeder but 2008 saw as many as 16 in the garden at one time. The image is of an open mouthed male (cracking a seed), in spring courting plumage. The winter plumage is more subdued but retains the same markings. Females and juveniles are duller. They feed on seeds, berries, fruit and insects. Breeding commences in April. The female constructs a well hidden nest of grass and moss at ground level or low in a bush and lays a clutch of 3 to 5 eggs. 25.02.2008 Four pairs feeding under bird table in garden. 05.01.2013 First pair of the year seen on a rural hedgerow. During the months April through September in the UK, there should be no problem identifying the Pied Wagtail. Its prominent black and white plumage, long black tail flanked by white outer feathers and it's characterisic 'bobbing' behaviour on the ground make identification straightforward. Females tend to be slightly greyer. But, during the winter months even the black plumage of the males tends to fade to grey and more caution is required when winter migrant Grey Wagtails and White Wagtails arrive from the continent. So, summarising, a black and white wagtail in the summer is probably a Pied Wagtail and a grey wagtail in the winter could be a Pied, Grey or White Wagtail. With the possible exception of north and west Scotlandand, the Pied Wagtail is a common resident of the UK, and can be seen all year round,. But, despite it being recorded every month in Lincolnshre, I don't see many wagtails at all in the garden during winter months. It is known to nest in the banks of streams, in trees and high up in the crumbling brickwork of old buildings and it usually has two broods each year, laying 5 or six eggs at a time. It's diet is mainly insectivorous and it can sometimes be seen paddling in shallow water looking for aquatic grubs and fish fry. 12.05.2010 First brood of the year has left the nest. 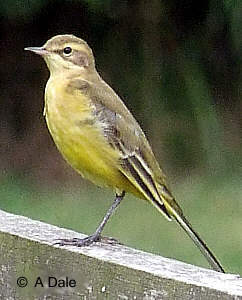 The Yellow Wagtail is a summer migrant from continental Europe, visiting the UK from April to September to breed. They are a ground nesting species choosing to nest in damp areas near water, such as river banks or meadows, where a plentiful supply of insects might be found. Although a fleeting glimpse of yellow breast and grey back might suggests that they could be confused with Yellow Hammers, their habits are quite different. This species, being an insect eater, has a slim beak and is always on the move darting from one location to the next in search of a meal whereas the Yellow Hammer, being a seed feeder, has a thicker beak and will usually spend time in one place carefully pecking the ground for seed. The longlegged and longer tailed Wagtail also has the very active and characteristic bobbing, tail wagging action. The other members of the UK wagtail family are the Pied Wagtail, usually with very distinctive black and white plumage, and the Grey Wagtail (which usually favours hilly terrain) with blue-grey and black upper parts and a very long tail. 21.09.2009 Male and female pair spent two days in garden thought to be en-route migrating back to the continent. The Starling population which had nationally been in decline for several years appears, in spring 2007, to be staging a minor local comeback. Whereas a wandering flock of about 20 to 40 had become the expected norm, some 200+ staged a noisy reunion in February 2007. That still falls short of the thousands that used to congregate but it is a heartening sign. Juveniles are normally grey/brown in colour getting progressively blacker as autumn and winter passes. The winter plumage tends to be heavily speckled and in spring the male's mating plumage takes on a lustrous blue/mauve/green sheen. Their diet is mainly insectivorous, taking flies on the wing and industriously spiking the ground for leatherjackets and grubs but, especially during winter months , they will also take seed and grain. 20.02.2007 Flock of approx 200 (biggest for years) foraging in adjacent field. 21.02.2007 50 in paddock next to house. 07.03.2011 150 in hay meadow and adjacent field for about an hour. 25.04.2004 First of the season heard passing through. 30.04.2005 First of the season heard passing through. 28.04.2006 First of the season heard passing through. 24.04.2007 First of the season heard - and seen (!) passing through. 29.04.2008 First of the season heard passing through. 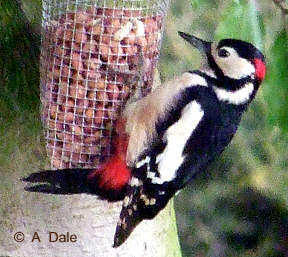 We have regular Greater Spotted Woodpeckers visiting the nut feeder. They don't keep regular hours but they are seen on many occasions. During the nesting season they will be taking nuts for their own benefit as their young will be fed with caterpillars and grubs. 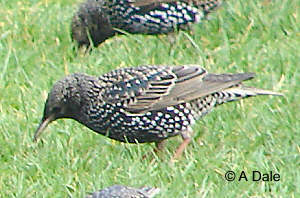 They are medium sized birds only slightly larger than Starlings and are at home high up in trees. In the garden they appear very nervous, never still for a minute. Even when feeding they can't have more than a couple of pecks at a nut without quickly looking over their shoulder to make sure the coast is still clear. 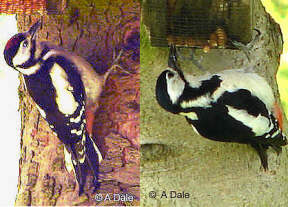 During the 2003/04 winter months, it was a male (upper image) with his distinctive red nape on the back of its neck which graced us with its presence. The 2004 summer only saw a female attend for snacks. But, 2006 saw lots of activity. Not only were the male and female seen but, a brood of young juveniles also came to the nut feeder. The lower image shows a juvenile on the left, recognisable by the red crown on the top of it's head. And on the right is a female which has no red on the head at all. But all have a patch of red feathers underneath the base of the tail. 08.08.2004 Female at the squirrel ravaged nut feeder. 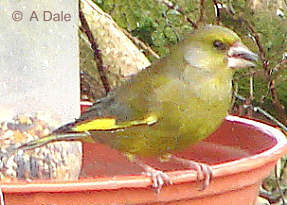 November 2005 A male is a frequent visitor at the nut feeder. 10.02.2006 A male and a female take turns to visit the nut feeder. August 2006 A female continues to make frequent visits the nut feeder. March 2010 Although both male and female visit the nut feeder they never come together. A species in decline. I can remember in my youth seeing huge flocks of Lapwings wheeling over farm fields and no walk in the country was free of their distinctive 'peee-wit' call. Now-a-days I count myself fortunate to have four in the neighbouring field. Also known in different parts of the UK as the Peewit or Crested Plover. Easily recognised on the ground by its prominent crest and, in the air by its broad wing tips and dipping, wheeling flight. The nest tends to be just a depression in a bare field and the parents go to great lengths to fool predators by creeping a considerable distance away from the nest before taking to the air. 13.05.2004 2 pairs in neghbouring field. 1 pair raised four chicks. 14.03.2005 2 pairs have returned to the nextdoor field - but, presumably due to crop rotation, did not stay. 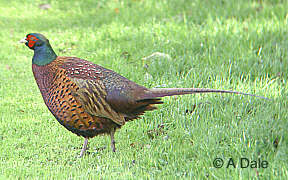 Pheasants are not a 'UK native' species, having been introduced from Asia some 600 years ago. Apart from some specific ornamental species which have bred 'true', the commonly seen game bird is a product of cross breeding and consequently comes in a variety of colours and markings. The male plumage can range from pale silver through the mid range of rich russet browns to glossy, metallic, blue, green and black and at up to 90cm in length can be very eye catching, some sporting smart white collars. The upper image is of an immature male - his tail is short and the spurs on the back of his legs are small. The females, although less spectacular, vary from pale creamy brown to quite dark brown. And all the adults are attractively marked. 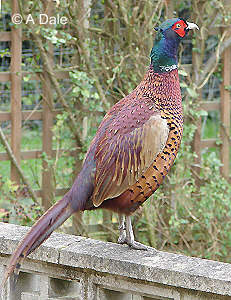 If you can't aspire to peacocks in your garden, pheasants are definitely the next best thing. Big attractive males will often 'acquire' a harem of hens. The hens are ground nesting birds and often share nest sites so, clutches of up to 15 eggs are not uncommon. However, these ground level nests are very vulnerable to egg predators such as foxes, rats, stoats and hedgehogs and the largest 'family' of chicks which I have seen grow through to adolescence was eight. They then split up and it was not possible to further monitor their progress. Once fully fledged and capable of flight all will take to the safety of trees, hedges and bushes to roost over night, returning to ground to feed on seed and grain. Pheasant's wings always seem to me to be on the small side for birds of their size, and the effort required to keep themselves airborne is reflected in the short time that they manage to stay aloft, even allowing for their graceful gliding abilities. July 2004 Family of eight adolescents fending for themselves. 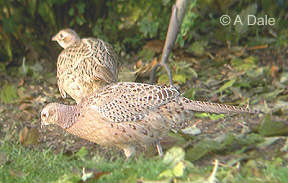 November 2005 Seven females and two males feeding in the garden - not necessarily related. November 2006 Just when I thought the females seemed to be more elusive this year, one large pair and one small pair arrived in the garden within minutes of each other. 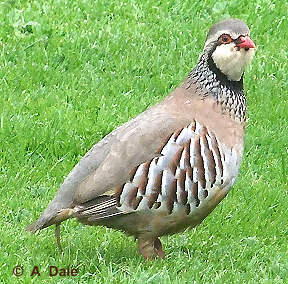 Red-legged Partridge are colourful and frequent visitors to the garden but, they are nervous birds and easily disturbed. They are usually seen in bonded pairs with the male leading the way and standing tall and proud, guarding the female while she calmly feeds. At the first hint of disturbance, they hastily depart, in silence if in cover but, once in the open or in flight they have a loud 'churring' alarm call. 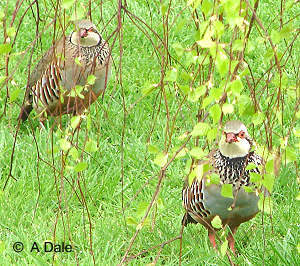 The Red-legged Partridge is not a native UK bird. It was introduced from France in the 17th and 18th century and consequently is often referred to as the 'French' Partridge. In some parts of SE UK it now outnumbers the native Grey Partridge. It is a ground nesting bird and needs a well concealed nest as protection from predators such as rats, weasels, hedgehogs, foxes and crows. Young chicks are obviously vulnerable and large clutches of eggs, up to 20, are laid to compensate for predation. 29.04.2008 Frequent visitor to the garden, homing in on the seed feeder. 01.05.2010 Pair now daily visitors to the garden. The Wood Pigeon is so common and such a voracious feeder on grain and young green crops that, in agricultural areas, it is recognised as a serious pest and may be shot at any time of the year. They are communal birds and large flocks are to be seen flying between their roosts in wooded areas and the fields where they feed. If disturbed, the 'clatter' of their wings can provide quite an explosive spectacle. At up to 400mm long, they are substantial, well built birds and on the ground they tend to walk with a rolling ponderous gait. They are clearly identified from other pigeons and doves by their larger size, the soft warm pink of the breast, the prominent white patch on the side of the neck and the white leading edge of the wing. These white markings show up clearly in flight. Their nest, high up in trees, is a loosely constructed affair of interwoven twigs sparsely lined with hay or grass stalks, in which a clutch of, normally, two white eggs is laid. 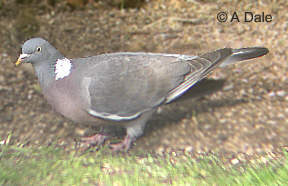 17.02.2006 In this rural area, the Wood Pigeon is a frequent (almost daily) visitor to the garden. At 330mm long, the Stock Dove is considerably smaller and not so heavily built as the Wood Pigeon so, when seen together, it is easy to tell them apart. The Stock Dove also lacks any white on its upper body and has two short dark bars across the middle of its wings (occasionally one of the bars may be obscured by the lay of the feathers). These short bars are generally regarded as its defining feature. Adults have a metallic green patch on the back of the neck. While the Wood Pigeon and the Stock Dove share similar habitats and will often be seen together, the Stock Dove is less gregarious and will not usually be seen in any great numbers. The Stock dove confines its nesting sites to holes in trees, crevices and animal burrows. All pigeons and doves feed their newly hatched chicks on 'pigeons milk', a secretion produced in the crop and not in sufficient quantity to feed more than two chicks. This accounts for all pigeons and doves laying no more than two eggs per clutch. The Rock Dove, Columba livia, is very similar to the Stock Dove in size and colouring but is recognised by having two strong black bars stretching the full width of its wings and having a white rump. 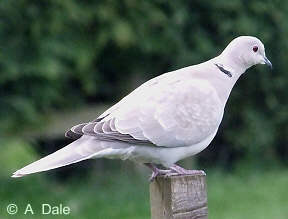 This dove is restricted in its habitat to rocky cliffs mainly around the Scottish and Irish coasts and was the ancestor of the ubiquitous domestic and feral pigeons which contiue to frequent the rocky ledges of town buildings. 12.02.2009 This is a fairly recent visitor to the garden, first seen in 2008. 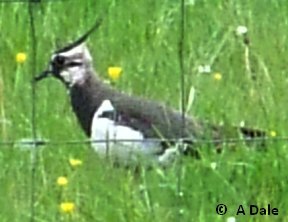 In 2009 two pairs are now seen regularly. 10.01.2013 First sighting of the year, one pair feeding on fallen seed from the elevated bird feeder. 01.01.2014 1 bird in garden. 31.05.2014 7 birds in garden, 1 appeared to be a juvenile. 09.01.2015 First sighting of the year, one pair feeding on fallen seed from the elevated bird feeder. The collared dove is such a common visitor to our garden that I find it difficult to accept that it has only colonised the UK from about 1955. It originated in the Balkans but since the 1930s has spread throughout Europe to as far afield as the Faroe Islands and Iceland. Despite its smaller size, it frequents and merges very successfully with the feral pigeons for the same habitats, being commonly found in rural areas around grain stores and sites where agricultural feedstuffs might be spilled. Whereas the pigeons can appear to be a bit assertive and territorial, the Collared dove is of a much gentler disposition and mingles quietly with all our other rural garden visitors. Its plumage is universally a soft pale grey and the adults sport a narrow black collar edged with white around the back of the neck. Although it only lays two eggs at a time, it is capable of five broods each year - which might explain its successful colonisation. 2005 All year round visitors to the garden. November 2006 We normally get one or two pairs in the garden but quite suddenly we had 24 sitting on the telegraph wires. 2007 Year round residents in the area and visitors to the garden. 2010 Regularly spend hours in the garden. 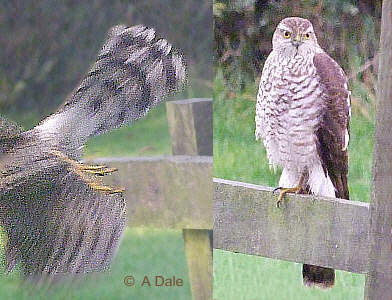 At 11 to 15 inches in length, the Sparrow Hawk is classed as one of the UK's smaller hawks along with the Kestrel and the Merlin and although they are all roughly the same size, the Sparrow Hawk always strikes me as being a larger bird. Maybe it is their long legs and long tail that fool me. We have a male and female pair which include our garden within their territory. They regularly swoop through to check out what activity there is around our seed feeder. In the upper image a Chaffinch was caught off guard and the grey and russet male hawk stayed to pluck his meal before flying off with it to the seclusion of a big Chestnut tree nearby. 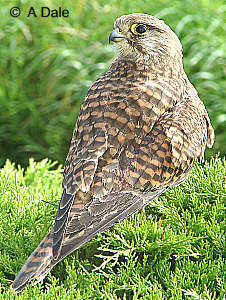 The female is larger than the male and is generally brown but the shade can vary with maturity and the breeding season. Both sexes have characteristically long yellow legs. The view of the female in flight shows the long, strongly barred tail. This, coupled with relatively short wings enables these hawks to chase prey with remarkable agility through tree branches. Although the Sparrow Hawks give the impression of being dominant in the garden, that situation only extends until the Swallows start breeding. I have seen the hawks being very agressively chased out of the garden by half a dozen squealing swallows swooping after them. And, what's more, the hawks do not return until the swallows leave for warmer climes at the beginning of September! 07.05.2006 A regular but, rarely successful, visitor to the garden. September 2006 The female, which I saw chased off by swallows in May, has returned - now that the swallows have gone. 31.12.2011 After an unsuccessful chase, a female remained in the garden for some time - to get her breath back? 01.11.2012 Female loitered in the garden for 30 minutes. Normally pictures of kestrels show them in a poised serene stance or hovering on the wing. Not so, the upper image. This young female had just chanced upon a fallen wood pigeon and was very 'puffed up' and excited about it. That may have been a ruse to imply to other predators that she was a much bigger adversary than she actually was. At maybe 340mm in length, she was much smaller than her 400mm lunch. 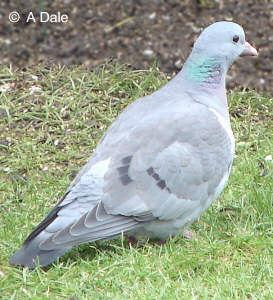 Females have brown barred tails, males are grey. 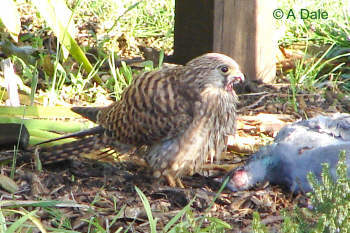 Normal prey for a kestrel would be small mice and voles or even beetles, so this was a banquet in prospect. She methodically took her time over it and did not leave much for others to fight over. Kestrel chicks hatch in May so, because of the yellow beak in the upper image, I presume that this one seen in November, might be a six month old youngster. As they mature, the beak darkens to grey and can have a black tip. One of the classic identification features is the dark 'tear stain' under the eye. The black tipped beak seen in the lower image indicates a more mature adult. I suspect that this one may have been injured because it uncharacteristically remained on a low bush for some time instead of seeking a lofty perch. And when it did depart it did so in a series of long gliding hops rather than powerful flight. Of course it may just have over-gorged itself! 23.11.2006 An opportunist visitor in the garden. 13.09.2008 Adult 'loitered' for some time in garden.